Rosenblatt Recitals has announced the plans for the 2015/16 with a strong season of recitals by a mixture of returning artists and those new to Rosenblatt Recitals. 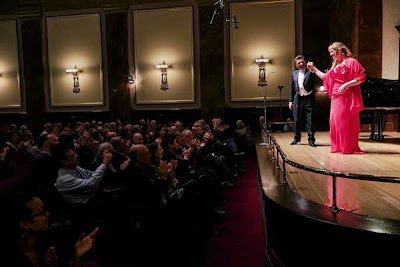 There will be Rosenblatt Recital debuts from Gianluca Buratto, Russell Thomas, Sumi Hwang and Charles Castronovo, and returning artists include Bryan Hymel, Javier Camarena and Ekaturina Siurina, Juan Diego Florez gives a recital at the Royal Albert Hall, whilst Leo Nucci gives a recital at the Cadogan Hall. The Wigmore Hall season is opened by tenor Russell Thomas, who made his UK debut as Lazarus in ENO's production of The Gospel According to the Other Mary. His recital includes arias from The Damnation of Faust and Fidelio plus songs by Brahms, Tosti and Barber (21 September). Leo Nucci and the Italian Chamber Orchestra perform Rossini, Verdi, Bellini and Donizetti. at Cadogan Hall (13 October). At the Wigmore Hall, Korean soprano Sumi Hwang performs a programme including Puccini, Schubert, R. Strauss and Berg (28 October). Hawaiian baritone Quinn Kelsey, who made his UK debut in ENO’s Rigoletto, sings Mussorgsky’s Songs and Dances of Death and music by Tchaikovsky, Massenet, Finzi and Copland (11 November). Mezzo-soprano Dorottya Láng, who is joining the ensemble of Hamburg State Opera, performs music by Wolf, Liszt, Schubert, Berlioz and Gounod (1 December). In 2016, performances include bass Gianluca Buratto making his Rosenblatt Recital debut (12 January 2016), Charles Castronovo and Ekaturina Siurina (16 March 2016) and Javier Camarena returns by public demand following his thrilling, and last minute debut last year. (14 April 2016). American tenor Bryan Hymel returns to the Rosenblatt Recital series for the first time since 2009 (25 February 2016). Juan Diego Florez returns to the Royal Albert Hall for his second Rosenblatt Recital there (his first was in 2012), and he gave his first Rosenblatt Recital in 2001.